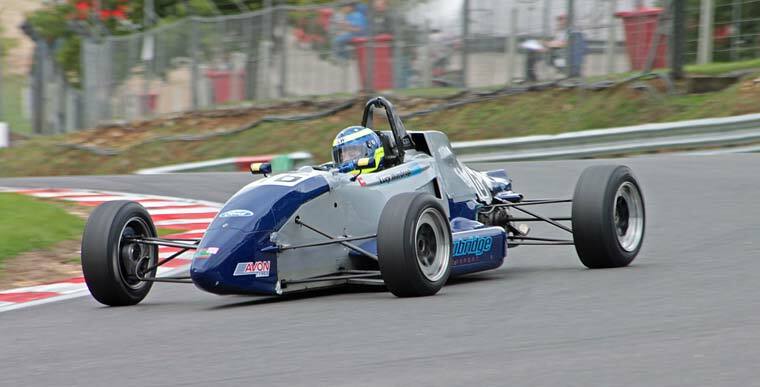 CSR provide a comprehensive range of services for Lucy Wardrop and her Formula Ford. Before events the car is checked and prepared and any necessary repairs carried out, the car is stored and transported to events by CSR. At the venue the car is put through the scrutineering test and set up ready for qualifying. The car handling and performance is discussed and set up changes made where required. Driver tuition and race strategy is a part of the service provided to Lucy. Formula Ford racing cars are designed to comply with a strict set of rules. Engines are 1600cc and chassis are a tubular space frame construction. The rules ensure that costs are limited and driver skill is the major factor in achieving success. Lucy Wardrop’s car is a Formula Ford zetec nickname ’Silver’. This is the only male racing car in the CSR workshop! It has an 1800 Schlor Zetec engine built by Alan Wardropper (no relation to Lucy) and the chassis is a Van Diemen 2001. 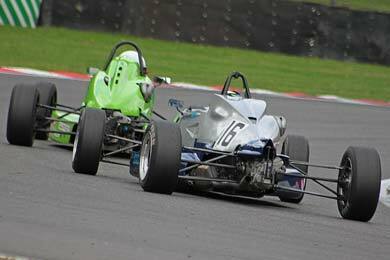 Lucy started racing Silver in 2003 when Zetec engine cars were part of the national Formula Ford racing series. Originally running in the Clubmans Championship, as it was more affordable, the Zetec cars had their own championship, but joined the National Championship at various race meetings. Lucy raced in this championship up to and including 2005 where upon they changed the main engine from Zetec to a 1600 Duratec engine for the 2006 season. Without the necessary budget to make the change Lucy found herself with nowhere to go racing and so had a break until 2009. In 2009 Chris Snowdon started running Lucy’s car. The first outing was in a 750 Motor Club meeting where Silver was eligable in the F4 class. This was to be a warm up race for her first go at the Formula Ford Festival in 2009, achieving great results, then taking part in the Festival in 2010 and 2011. Lucy’s racing career started on a high in 1998 at Silverstone. She gained her race license with the race school and raced in their in house FF1600 winter series championship, which she won. More success followed in 1999 in Silverstone’s main series in FF1600 where again, as with the winter series, she took fastest laps, pole positions and race wins throughout the season finishing second overall in the championship. At the end off 1999 Lucy took part in the French Elf La Filiere Scholarship (which was funded by a career award she won, sponsored by Bodyform). Silverstone ran the qualifying rounds in the UK – Lucy was the only girl and the quickest single seater driver, but narrowly missed out on heading out to study at the Elf La Filiere at Le Mans. A lack of funds meant Lucy didn’t race again until 2002. She bought a 1999 Van Dieman and did some races in the BRSCC Southern Formula Ford Championship. In 2003 Lucy started racing ‘Silver’. Running again in the BRSCC championship, just doing a handful of rounds and making her way up through a very competitive grid. 2004 was a good turning point consistently qualifying and finishing races within the top four. 2005 was even better! Still racing at Silver in the BRSCC Formula Ford Championship consistently on the podium in either 2nd or 3rd place, but never quite making it to p1! Championship rule changes meant Silver was no longer eligible to race with the BRSCC forcing Lucy into another career break. 2009 was when Chris Snowdon took over the running of Silver and together they headed out in the Formula Ford Festival, Lucy’s first. It was a combination that clearly worked. CSR’s car preparation, setup and driver coaching from Chris saw Lucy through the qualifying rounds to the final and finish in a fantastic sixth place. This successful partnership continued in 2010, finishing her second Formula Ford Festival second in the final. In 2011 they raced in an open single seater race at Brands Hatch as practice for the festival and finished first in the class, which was third overall among some more powerful cars using wings. At the 2011 Formula Ford Festival they came third in their first race. In the final they were straight up to second place and looking very strong. Sadly the race finished in the gravel trap at Druids when Lucy was ‘wiped out’ by another competitor! Future plans include possibly converting Silver to a 1600 engine car and racing in Sports 2000.